Benny and I had hunted caribou together twice in the past, both times in the Brooks Range, once with our fellow Gang-Twanger, Ozzie-wanna-be, mate RicMic. We had previously researched going to Adak Island, home to the world’s largest bodied caribou, and we decided that this was the year. 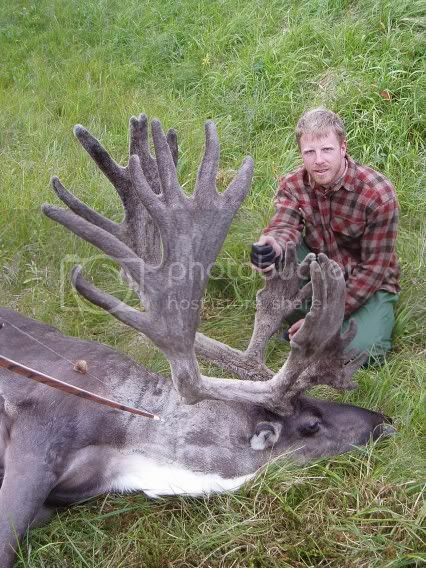 Caribou were transplanted to the island in, I believe, the late forties. 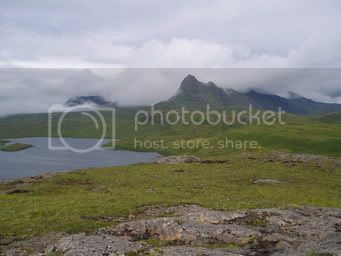 Adak Island is in the Aleutian chain and has an interesting military history. I had located a boat owner that agreed to drop us off on the side of the island known to harbor the densest concentrations of caribou on the island. When I contacted him the evening before our departure (the third time we talked) he did some song and dance about only being able to take us out for 3 days. Well, there are only flights in and out of Adak on Thursdays and Sundays so that wasn’t going to cut it. Somehow, we managed to locate the one known, reliable boat captain on the island that is permitted for drop-offs and arrange our trip in the last hours before we were forced to cancel. Getting to Adak is very expensive unless you have Alaska Air miles to purchase your ticket. We also had to cough up $230 per night each way for local lodging. 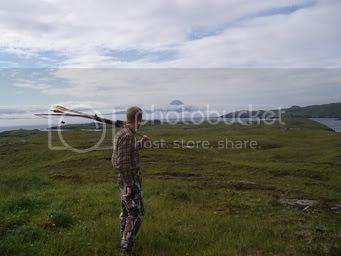 We stayed the course for our flights and arrived on Adak on Benny’s 24th birthday after staying with his childhood buddy, Matt Richard, the evening before. The best thing that happened on the trip was meeting up with our new friends, boat captain, Al and his buddy who everyone refers to as “Shipmate” and refers to everyone else as “Shipmate”. We had an enjoyable 5 hour trip along the east and south shores (Pacific Ocean side) of the island to a drop-off spot where we packed our gear across a peninsula to a cabin owned, yet not maintained by the USFWS. The cabin was rat infested. Rat droppings, rat urine, rat vomit, rat parts, and a rat nest with RATS! I took one out with a shovel and Benny, doing his best impression of his Norwegian Viking ancestors, took one out with his battle ax. We opted to pitch our tent on a grassy knoll above the cabin but we did use the cabin for dry gear storage. Here is a view of a mountain as viewed from the Rat Cabin that we affectionately referred to as “Mt. Doom”. 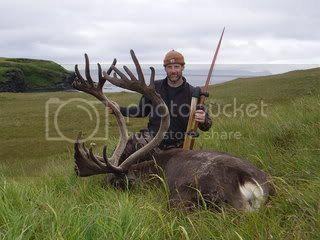 I had spotted a group of five bull caribou on the pack in so we quickly strung our bows and set out on our first stalk. 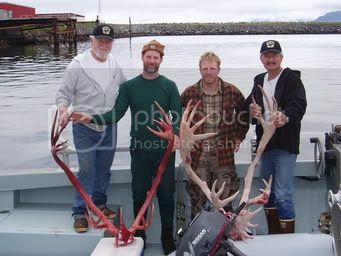 One bull was definitely a shooter with short yet extremely massive and well palmated tops with long tines. We got close but it wasn’t to happen that day. Caribou sightings over the next few days were lean but we did find a couple and I did a controlled push of one to Benny that went out of control as the caribou raced by Benny at 15 yards at full tilt. We were then able to stalk another bull that we spotted prior to our previous stalk. The bull fed on kelp in the intertidal zone as I slipped up close and slipped up on my opportunity. The day advanced into a warm, clear afternoon and we admired the volcano on a neighboring island. We had been told if the volcano is visible then a bad storm is coming! The flowing day we re-located the big bull from the first day, about 4 miles from camp, and unfortunately too late in the day. The storm arrived. The winds blew and the rains fell hard, and then the fog sank to the ground. I had to restrain my youthful, eager partner on a day meant to be spent in camp. Late the following morning the fog started to lift and we geared up to go search out that one bull. We hadn’t even left camp as five bulls including the big one of Benny’s dream appeared on the ridge top adjacent to camp. We waited until it was apparent which way the bulls were traveling and Benny got into position in a small stream bed in front of the feeding bulls with my instructions to not shoot one of the little ones. The bulls soon boiled out of the draw with the big one wearing Benny’s fletching colors on his side. I soon learned that Benny had almost been trampled by each animal before the last and only large bull of the group presented a shot at NINE (9) FEET!!! When we walked up to the downed bull he was immense! We hadn’t fully realized just how huge a body these animals have. 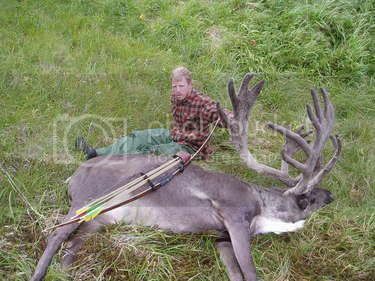 He was by far the largest bodied caribou I have ever seen and my weight estimate only starts at 500 pounds. I measured his nose to tail length at exactly eight feet! Benny was as excited as a puppy on fresh newspapers. I was almost most excited that the animal dropped 30 yards from the salt water so we wouldn’t have a rough pack job! Two days later, our second to last day, we headed out for a long day, headed deeper onto the peninsula than we had previously traveled. We located a group of four caribou including two decent bulls about four miles from camp. I was able to maneuver around a rocky coast and get in a small creek bed and stalk to one of the larger bulls. As the bull fed toward me at less than twenty yards, a ptarmigan popped its head up ten feet away and threatened to blow the scene. I held my breath. The bull moved closer and the ptarmigan appeared again on the bank above me. I held my breath again. The bull moved to about 8 yards and spooked back to twenty yards at the site of the blob in the stream bed. Go time. I came to full draw; my arrow sank into the ribcage of the bull, and he fell after a 90 yard sprint. 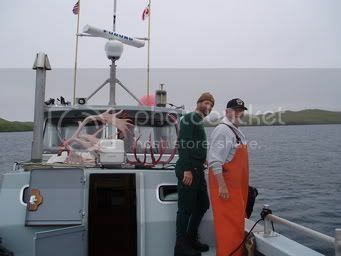 Al and “Shipmate” picked us up on our scheduled time and date and we enjoyed a calm four-hour boat ride back to the village of Adak around the west and north side (Bering Sea side) of the island. Folks have asked me about this hunt and what it takes to pull it off. As we did it, I wouldn’t highly recommend this trip as a routine caribou hunting option at this time. The trip was fairly expensive (relieved by air miles), the weather can be really drastic, limited flights in and out of Adak, and we only saw 4-6 mature bulls in about 10 days but did capitalize on two of the largest bulls that we saw.